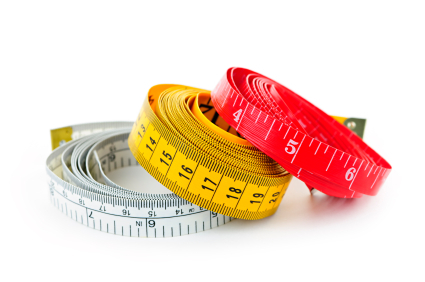 Are you measuring your social media efforts? Do you know what’s working? Over the years, there have been dozens of social media monitoring tools launched, but not all social media monitoring platforms are created equal. In this article I’ll show you five platforms that may work for your business. Before taking a closer look at these platforms, here are a few questions you’ll want to answer first. Your answers will allow you to find the right tool for your business needs. What Does Your Business Need to Measure? The most important thing to establish before selecting a monitoring tool is what you’re actually going to measure. Any social media campaign worth its salt has clearly defined objectives and measurable outcomes. It's important to determine what you want to measure. Image source: iStockPhoto. These measurable outcomes, or key performance indicators (KPIs), are agreed-upon metrics that will help you determine whether your social media marketing efforts are successful. They can fall into several categories and include thousands of exact pieces of data. Reach. You might want to measure the number of fans, followers, blog subscribers and other statistics to gauge the size of your community. Engagement is measuring retweets, comments, average time on site, bounce rate, clicks, video views, white paper downloads and anything else that requires the user to engage. Competitive data may include the brand’s “share of voice” across the web or number of competitors’ brand mentions. Sentiment. You might want to measure the numbers of mentions with positive or negative sentiment. Sales conversions. Do you want to measure social media referral traffic to the top of the sales funnel or number of sales aided by social media efforts? The amount of data you need to collect and archive will help determine the cost of social media monitoring for your business. If your company is large with hundreds or even thousands of brand mentions across the social web per day, you can expect the cost of your social media monitoring to be on the high end. Tracking and storing a large amount of data have a cost attached, apart from the tools’ other features and functions you may want to sign up for. But before investing in the most expensive tool that promises to keep all of your data forever, ask yourself if you really need it. Do you have the internal resources to sort, monitor and manage all of that data? Are your KPIs dependent on tracking and responding to every social mention? Smaller companies have a wide array of monitoring options at various price levels available to choose from. Many of the lower-cost tools include some sort of Google Alert integration. Google Alerts are the best free way to monitor your brand terms across the web. Enter a query that you’re interested in, and Google Alerts checks regularly to see if there are new results for your query. If there are new results, Google Alerts sends them to you in an email. Google Analytics is another free tool to help track social media. Social Media Examiner published a great article on this very topic: How to Measure Your Social Media Traffic Using Google Analytics. Google Analytics not only lets you measure sales and conversions, it also gives you fresh insights into how visitors use your site, how they arrived on your site and how you can keep them coming back. I would be cautious about using tools that cost less than $100 per month and promise to do everything. A number of tools fall into this category and my experience has been they don’t really do any one thing well. So to get the best deal, arm yourself with the knowledge of exactly what you need to track and/or manage and don’t get seduced by all of the extras. There are more key questions to consider before investing in a social media monitoring solution. Your answers will help you determine the functionality you need and make the choice about what you are willing to pay for. How many people will be monitoring and managing your accounts? Do you only want to monitor social media mentions, or would you also like to manage your social media profiles using this platform? Which profiles are you most active on? You’ll need to be sure your chosen tool supports the networks you use. How long do you need to archive the data? Do you need annual reports, or will monthly reports suffice? Does the data need to be exportable? In which formats? Do you need sentiment analysis? Do you need share of voice metrics requiring vast amounts of competitive data from across the web? What type of customer support are you looking for? Do you need your monitoring tool to integrate with other tools like Salesforce, Google Analytics, etc.? After answering these questions, you should have a good idea of the requirements you have for a tool to measure your social media marketing results. Let’s now take a look at a few platforms. Here’s a comparison of five popular monitoring tools. Teams of developers are constantly updating these tools, so be sure to contact the platform directly for the most up-to-date information on which social media platforms they support. Viralheat is a platform I’ve used for several years to monitor share of voice for clients at a very reasonable price point. Over the years, their team’s developers have worked to make it a fairly sophisticated monitoring and management tool that any business can afford. The $49.99 monthly plan allows businesses to manage 15 social accounts and monitor 2 search profiles across Twitter, Facebook, Pinterest, video and the web. One of the most compelling features allows users to compare search profiles or relevant terms across the web and social media so businesses can track individual products and compare social buzz among their own products or compare their brand mentions to competitors’. Viralheat offers a few ways to visualize this data in a graph or a pie chart. 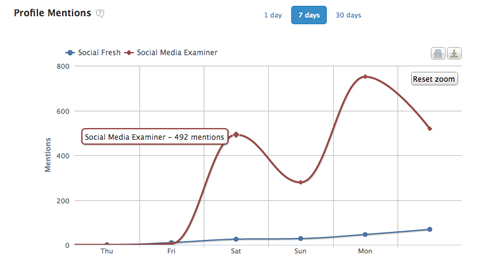 The images below show the total mentions over the weekend for Social Media Examiner as compared to Social Fresh. 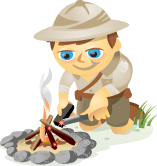 Viralheat’s Compare feature allows brands to compare their overall brand mentions to their competitors’. 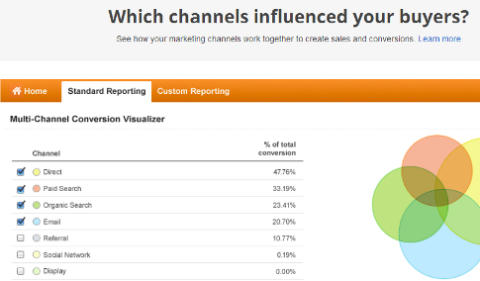 Viralheat’s Compare feature also allows users to export the data as a pie chart. By comparing these social media mentions over time, you can determine if campaign efforts are helping increase brand buzz across the web. 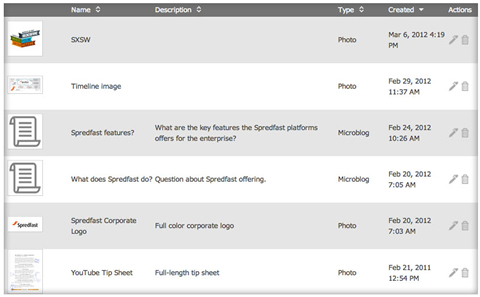 Spredfast is a social media management system for the enterprise. It may not have the most robust tools to report on competitive metrics, but it’s extremely good at organizing content managed by larger teams of community managers. Spredfast offers the enterprise efficient ways to manage content, including an online content library that can be accessed by multiple teams. Jive community manager Melissa Barker recently recommended this tool during a digital marketing webinar. You can watch the on-demand version to hear her exact thoughts on Spredfast. Other compelling features include a content library that allows teams to share content internally, integration with Google Analytics or Omniture and the ability to track customer-care issues resolved via social media. Sysomos is a tool that has enough power for larger companies, but doesn’t have the enterprise price tag. They throw in quite a few bells and whistles for the $550 per month plan, including unlimited data, 5 users and a dedicated account manager. The $500 setup fee covers the charge for back-filling your brand data for the last 30 days. This can be extremely useful, especially if your decision to invest in a monitoring tool is the result of a recent online event or competitor’s campaign. Once you sign up, your data will be saved for as long as you are a client, no time limit on your data and mentions. Sysomos provides both social media monitoring across the web (share of voice) and management of your company accounts including YouTube, Facebook, Twitter, Wikipedia, LinkedIn and Google+. 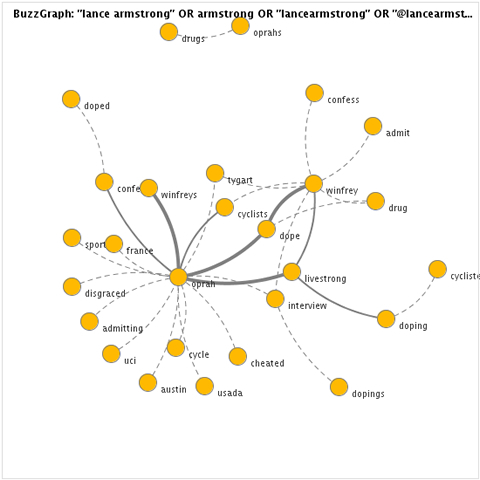 Sysomos text analytics tools include buzzgraph, shown above using keywords related to Lance Armstrong. The entire article, The Buildup to Armstrong vs. Oprah, can be found on the Sysomos blog. Sprout Social is a modestly priced tool that can effectively help manage and monitor your company profiles on the web. The $39 standard plan includes the management of up to 10 profiles, the ability to publish and schedule messages and limited monitoring. If you are looking for any type of share of voice brand metrics across your industry, this is not the tool for you. They do offer a good set of basic tools for straightforward campaigns on the main social media platforms. In order to help with managing campaigns on the go, they have mobile versions of Sprout Social for iPhone and Android. In terms of listening for or monitoring your brand terms, they only dish up results from Twitter and Facebook. However, they also offer a feature called Web Alerts that acts as a way to monitor brand or company mentions from sources other than social media. Sources include blogs, news sites and other content sources. For a more detailed look at how this works and why it might be valuable for your business, check out the Sprout Social blog. 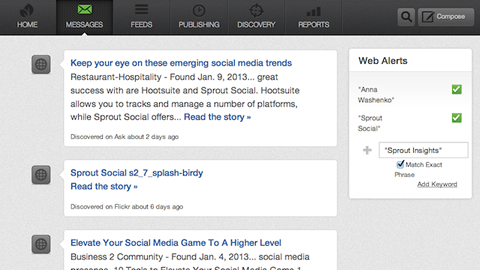 Sprout Social’s Web Alert feature allows brands to track mentions across sources OTHER than social media. UberVU is a tool working to provide actionable insights instead of reams of useless data. When compared to other tools, UberVU sources the most social media networks when providing monitoring and listening data. The ever-expanding list of networks they claim to monitor for your keywords include Facebook, Twitter, LinkedIn, Blogger, YouTube and Picasa, with Google+ coming soon. The lowest-priced plan of $500 monthly includes five streams of data. A stream includes any profiles or accounts you want to manage plus any brand terms you want to monitor. The basic plan also includes a dedicated account manager, live customer support and free training. They do put a limit on the number of mentions they will monitor per day, 10K for the basic plan and 50K for the professional plan. A key feature called Signals scans all of the mentions and conversations relevant to your brand in real time and detects dozens of signals like influencer mentions, spikes in volume and sentiment, trending stories and more. The tool will then attempt to detect and filter actionable information into categories like Review, Reply or Publish and then shoot you an email alert. UberVU offers the means to monitor, filter and act on relevant conversations from around the web via Signals. Are you ready to become a monitoring maven? The tools listed above just scratch the surface of great social media monitoring options. If I had a dime every time a client asked, “Can’t I just get everything into one dashboard?”… I have yet to find a tool that will do that. What do you think? What social media monitoring tools are you using? Have you found one tool that will do it all? I’d love to hear all about it! Leave your questions and comments in the box below. Lisa is a leader in the field of digital marketing. Based in Portland, Oregon, she serves as editor at ThoroughlyModernMarketing.com. Her services include content strategy & social media consulting.